That grinding against wood and dirt you hear is the sound of Steve Jobs rolling over in his grave. Microsoft is back! And badass! Today's Surface event in New York City outclasses Apple by every measure that matters: Aspiration, innovation, presentation, and promotional marketing. Microsoft proves that it can build end-to-end solutions—hardware, software, and services—as good as, and better than, the company cofounded by Jobs. Even more importantly: Present the new wares well. Today's event was exceptional. But there is a shadow looming in the brightness that will matter to some Microsoft customers and not to others: Cost. Surface Book, for all its seeming greatness, is a budget-busting laptop for the majority of potential buyers. The low-cost config, at $1,499, comes with 6th-gen Intel Core i5 processor, 8GB RAM, and 128GB storage. To get the discreet graphics demoed today, with i7 chip, 8GB memory, and 256 SSD, you will spend $2,099. Doubling RAM and storage raises the price to $2,699. But every product is a measure of its benefits, and how well that they balance. Detachable 13.5-inch touchscreen, 3000 x 2000 resolution, 3:2 display ratio, pen stylus, and conceptually above-average keyboard are standard fare for all models. Surface veep Panos Panay calls Microsoft's laptop the "ultimate computer". I can't confirm without testing, but he presents Surface Book as a believable MacBook Pro Retina Display-killer and the kind of real innovation that Apple delivered when Jobs walked this Earth. I will go further, and be damned for saying so: Panay gave a better-than-Jobs introduction to Surface Pro 4 and Surface Book. When he walked out into the audience to pass around the new laptops, I was stunned. He easily swamped the disgustingly over-marketing hyped launch of iPad Pro. Where Apple presenters over-used words like "amazing", Panay repeatedly used "you"; that is much more aspirational and demonstrates attention to design that is more about the user than the product itself. You. You. You. That is the over-arching theme from the entire event today. If you missed it live, watch the replay. Microsoft CEO Satya Nadella expanded on the theme, too, when rightly observing that devices come and go. "You are the hub", he says. That's a concept lost on Apple, which innovation focuses more on selling more devices for the so-called post-PC era. That concept is an underlying development philosophy permeating Microsoft. "You" isn't just marketing. In an August 2015 analysis that you really should, I highlighted how the company is in process of meaningful reinvention. The strategy of releasing apps and services for multiple platforms—hehe, including Apple Watch—are part of a broader platform strategy where you are the center. You are the hub. We do not live in the post-PC era. That's an Apple illusion to sell more iPhones. This is the contextual cloud computing era, which Alphabet (formerly Google) gets and surprisingly so does Microsoft. You are the hub. The device is your extension. Your stuff is available anytime, anywhere, and on anything. Along that path: Microsoft's Continuum concept isn't newfangled, but I saw it meaningfully move forward during the Surface event—and the development philosophy far better fits the era of context than anything Apple sells. 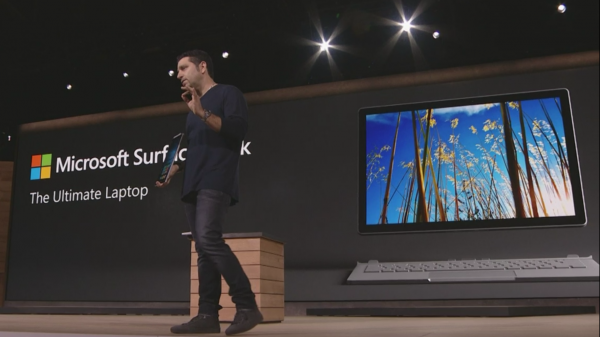 A Microsoft Surface device commercial shown near the end of Panay's presentation begins: "There is a rhythm. You have to listen to hear it. It beats inside each and everyone of us. It beats like a drum. It says: 'Get out there. Create. Do something special'. It is the rhythm of inspiration". The theme, like everything else: "You". In a January 2004 critique, I faulted Microsoft for focusing on new features in Plus! Digital Media Edition, while Apple promoted iMovie with the aspirational: "You are the editor". "You are the director". "You" was once a development philosophy for Apple. Microsoft's adopts it but better, by providing a vast suite of applications, cloud services, and server software that spans across platforms. Anytime. Anywhere. Anything. You can accuse Microsoft for copying Apple. The company that Jobs cofounded is the perennial imitator, doing better what already was done before. Microsoft gets it, too. By the way, for years the company had some of the worst nomenclature in techdom. Following Apple, in this decade, Microsoft gives names to some features, like Surface's PixelSense. The tactic makes the specific innovation easier to identify, more likely for people to remember, and easier to market. Circling back to the beginning: For anyone wondering if Microsoft risks channel conflict with Surface Book, I conclude that Surface tablets already demonstrate there is little concern. The laptop's pricing eliminates even the "little". The Redmond, Wash.-based company isn't competing with its OEM partners but Apple. Wherever creatives or executives run Microsoft applications on MacBook Airs or Pros, these users now have alternatives to buy for about the same price but with more capabilities. No Mac offers touchscreen and stylus or moves forward with improved hardware, software, and services benefits like the Surface line. If anything, Microsoft does good for OEMs by offering to image-conscious CEOs and other corporate execs, lust-worthy Windows alternatives to pricey Macs. PC manufacturers can only benefit if top decision-makers who otherwise would want Mac laptops ask for either new Surface instead. There is trickle-down benefit from re-untying the IT infrastructure around Windows and the influence on purchasing lower-costing Windows notebooks elsewhere in the organization. Microsoft doesn't create conflict with partners but generates more with Apple and potentially reduces conflict within enterprises that are the core market. My question: Will the Apple-loving blogosphere give Microsoft the credit it deserves for the new Surface hardware, the underlying "you" philosophy behind them, or the magnificent presentation introducing them (and also new Lumias)?